Bill Lowman’s road touring machine carries Idyllwild heritage. Bill Lowman, the founding headmaster of Idyllwild Arts, commissioned me to build a steed with which he’ll ride into retirement. Bill’s retirement ceremony kicked off this past Friday, June 25th, and took delivery of his new bike on the same day. He’s leaving tracks from Idyllwild and will be enjoying a number of supported road tours, some with his new bike. Bill leaves Idyllwild a town changed for the better. Read more about him here. I was quite honored to take his bike order… and challenged to execute it. 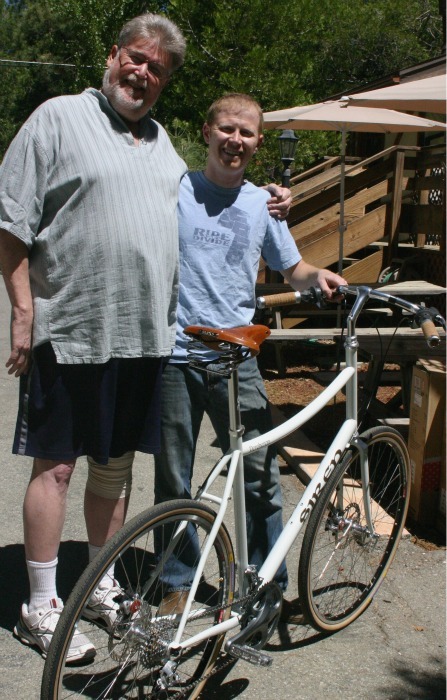 Bill is a big & tall guy, with some additional needs that affected the design & component selection of his custom bike. 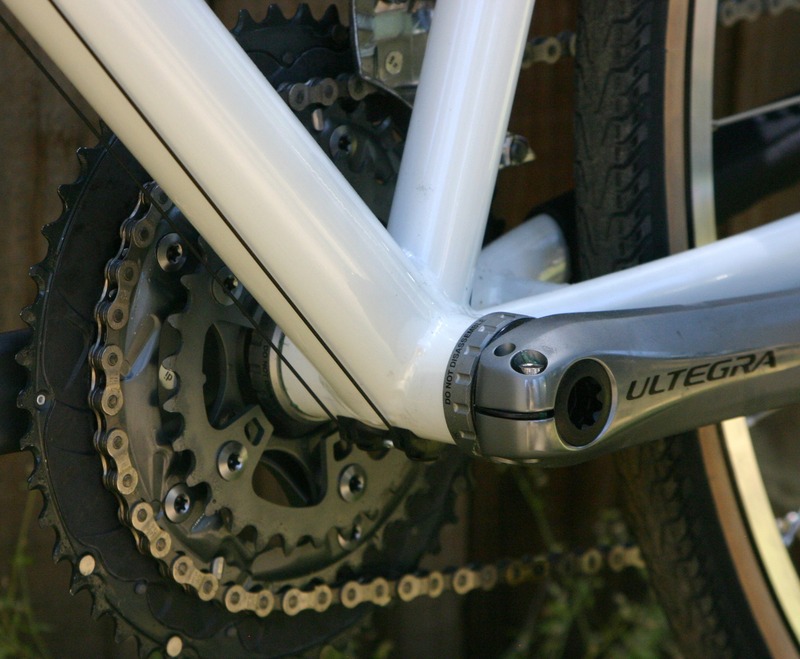 Bill had been riding a mountain bike (with slicks) primarily on roads before the Percheron. He wanted his new bike to be more efficient, faster rolling, offer an upright position & ease of use in the component selection, particularly with the Grip Shift. The process started with some chatting with Bill about the bike he’d been riding, his goals with the new bike, and some measurements all around. We discussed some different ideas, first focusing on the cockpit, wheelset. 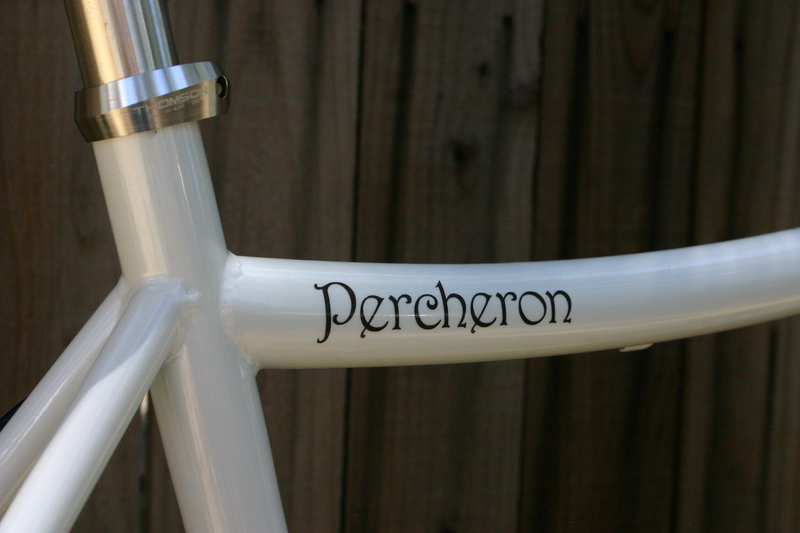 We ended up naming the bike “Percheron” after the large French horse breed and a paricularly amusing experience Bill had on a trail ride some time ago. 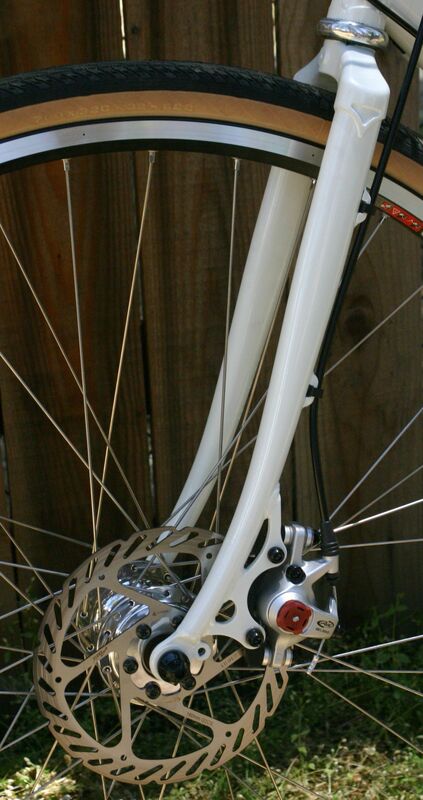 We settled on a nice pair of wheels, which I built up using Phil Wood 36H hubs, laced 4 cross with double butted spokes for lighter weight & strength. We used DT Swiss eyeleted rims, just a bit wider than a typical “road” rim to give a bit wider footprint with the Panaracer 32c touring tires. These wheels are smooth and fast, but plenty strong. We decided to start working with a Soma Sparrow handlebar, which offers some additional hand positions like a road bike’s drop bar, but with only 50mm drop and a dramatic flare, which I figured would be more comfortable. 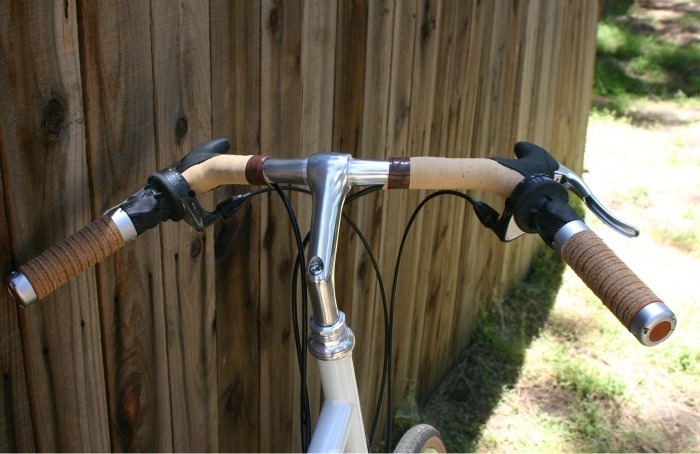 We paired the Sparrow bar to a set of Brooks leather grips, Grip Shift, and Shimano road bike brake levers, joined with a little cork tape. The whole shebang mounted to a Nitto MT-10 quill stem, chosen for easy adjustability and elegant looks. 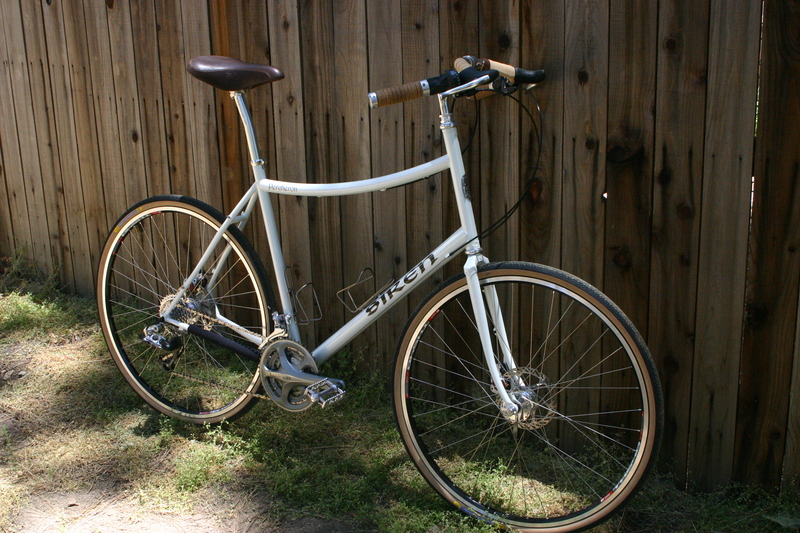 Russ built up the custom fork; a 1″ threaded steerer tube (for the quill stem) mated to a cyclocross fork crown, heavier fork legs and an ISO disc brake mount for the Avid BB-7 brakes. The fork elegantly ties together the functionality of the disc brakes with the good looks and easily adjusted handlebar setup. 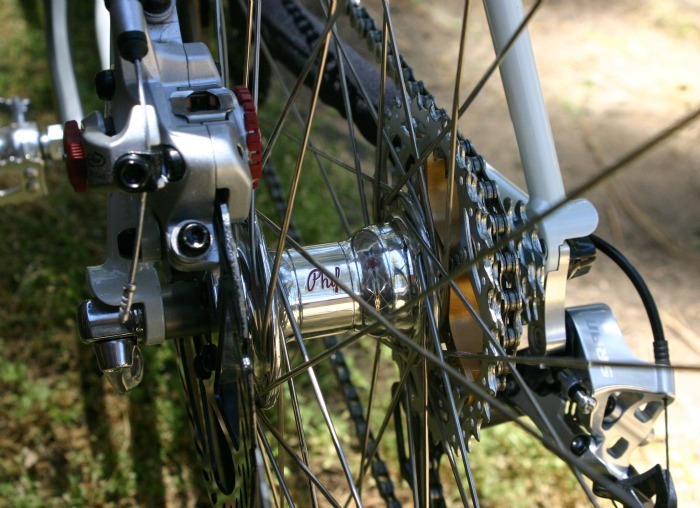 It all pivots about a Cane Creek 10o headset, in polished silver. Bill is hitting the road today, as I type this, with his Percheron traveling off on the open road. 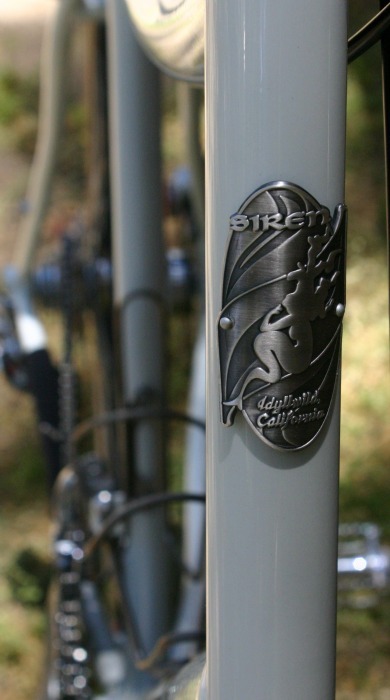 We’re proud to know he has a special connection to Idyllwild, the name of the town stamped on the head badge on his new steed. Happy trails, Bill! – and don’t forget to send us a postcard.